For years now, with a bit of a smile, the Count had remarked that this or that was behind him—like his days of poetry or travel or romance. But in so doing, he had never really believed it. In his heart of hearts, he had imagined that, even if unattended to these aspects of his life were lingering somewhere on the periphery, waiting to be recalled. But looking at the bottle in his hand, the Count was struck by the realization that, in fact, it was all behind him. Because the Bolsheviks, who were so intent upon recasting the future from a mold of their own making, would not rest until every last vestige of his Russia had been uprooted, shattered, or erased." I was lucky enough to visit Moscow this summer. 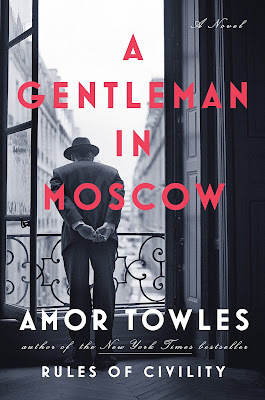 I was also lucky that another American I met there recommended reading A Gentleman in Moscow. I had never heard of it, but upon walking past the grand old Metropol Hotel, where the novel is set, I made a mental note to add the novel to my reading list. I am glad I did. There are two main characters in this novel. The first is Count Alexander Ilyich Rostov, an aristocrat who is sentenced to house arrest by a Bolshevik court in 1922. The second is the place of that house arrest — the grand old Metropol Hotel in Moscow, where politicians, diplomats, foreign correspondents, and movie actresses all pass through. Count Rostov spends decades there under house arrest, eventually learning every room and hallway, every employee, every routine. It takes a while to get to the novel's climax, first meandering among the stories of the people in the hotel and in the Count's past and present life, but it's an entertaining journey. We learn a little Russian history, culture and character along the way. But eventually it all does come together in a very satisfying climax and conclusion. Add this to the list of books to consider for Richardson Reads One Book. The One Book Committee is in the process of selecting a book for 2019 so I’ve passed the suggestion along. Thanks.